Why is Turbulence Not Usually Dangerous? Home > Technical Facts > Why is Turbulence Not Usually Dangerous? Can turbulence be dangerous? Actually no, it can’t. Many people believe that air turbulence can cause the aircraft to suddenly drop thousands of metres. Have you ever heard someone say, ‘I was in a plane that just dropped out of the sky’? Well actually, if a measurement were taken of the height that planes usually ‘drop’ during a spell of turbulence, the distance would probably be around 50mm! There are three different types of air turbulence that is likely to be encountered during a journey in a commercial aircraft. Regardless of the type of turbulence found, pilots will always know it is coming and they will be prepared for it. The first type of turbulence is found at high altitudes, often referred to as ‘air pockets’. There is no such thing as an air pocket, it is not physically possible to get a ‘pocket’ of air, but it is a commonly used term that describes the feeling of a sudden drop when flying. However, the drop people experience feels much worse than it actually is. Aircraft move very fast at high altitudes – they cover the length of three football pitches in about four seconds. 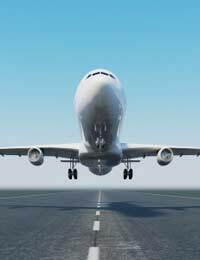 Any air that is moving downwards when the aircraft passes through it can result in a little jolt. But remember, there is always air moving upwards as well, so it is impossible to drop very far. Because the aircraft moves so fast, the effect that downward moving air has on the aircraft’s altitude is minimal – because the upwards moving air will cancel out the effect. Airfields are usually surrounded by buildings; sometimes buildings can be quite tall and wind blowing around them can create turbulence. Think of a fast flowing river as it negotiates rocks in its path. The river will produce many turbulent patterns, usually seen as white water bouncing around the rocks. Depending upon wind speed and direction, the end of the runway can be directly in the path of ground air movements. However, pilots will know about this well in advance. Pilots will be briefed about weather patterns well before they start their approach into the airport. Sometimes they will hold off the approach until the air movements become less strong. But even during a bumpy approach, the aircraft is flying fast enough to cut through the air movements, and again, very little altitude change will occur. Although it can seem like the aircraft is bouncing around in the sky, in real terms only a few centimetres of uncontrolled change will be likely. Another type of turbulence that may be encountered is caused by storm clouds. Sometimes severe turbulence can be experienced when flying through stormy weather. But again, pilots will know well in advance that storms are in the area. They constantly monitor their weather radars and they get regular updates from air traffic centres. On a flight of 500 miles, pilots may talk to 20 different air traffic centres, and each one is capable of providing up-to-date information about winds, clouds, storms and turbulent air movements. Equipped with this information, pilots will always try to avoid stormy weather. Sometimes passengers worry about flying through storms, thinking that pilots don’t have any choice but to continue in the direction that they have been given. This is completely wrong. Pilots are able to vary their flight altitude and heading to avoid unnecessary discomfort to passengers. Air movement can be used to great advantage. Jet streams, which are caused by a combination of solar heating and the Earth’s rotation, usually move from west to east. These fast moving air streams are used by pilots to reduce flight times. Flight times when travelling from the US to the UK can be reduced by over an hour when flying along the edge of the Atlantic jet stream. hi, i love flying but get really scared during turbulence…strange question but if you were looking at a plane that was going through turbulence from the ground would you be able to see the plane bouncing around ? i think you should take the "Not Usually" out of the title, because that implies that turbulence might be dangerous. And i dont think anyone thinks that the plane will fall out of the sky, more like the wings might fall off during turbulence.